As part of Stampin' Up! 's 25 year anniversary, they are bringing back some of the all time favorite stamps and combining them in to 12 stamp sets. Each month a new one is released. The stamp set will also include a never before seen image. 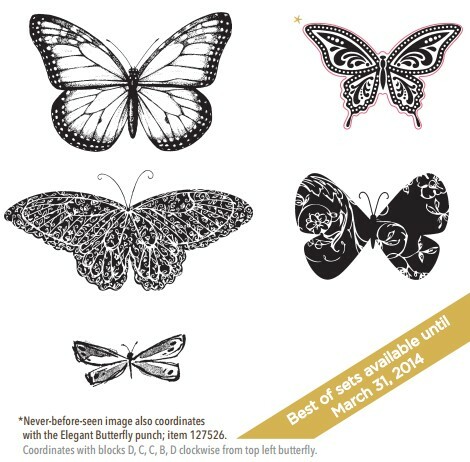 April's Best of Stamp set (item # 133345) features butterflies which I'm VERY excited about since I love butterflies!!! While they are releasing just one Best of stamp set per month (with a new theme each month), all of the Best of sets will be available until March 31, 2014. As an added bonus....they're including a collector's card and 25-year proof of purchase sticker with every Best of set. Collect six stickers, and send it in to redeem a FREE set of your choice valued up to $14.95! Free sets must be redeemed no later than April 30, 2014. To order your Best of Stamp sets go to http://brittnysmith.stampinup.net then click on "Shop Now" under the Products tab. Stampin' Up! FREE SHIPPING Weekend!